What we’re seeing here is an ammonite fossil. 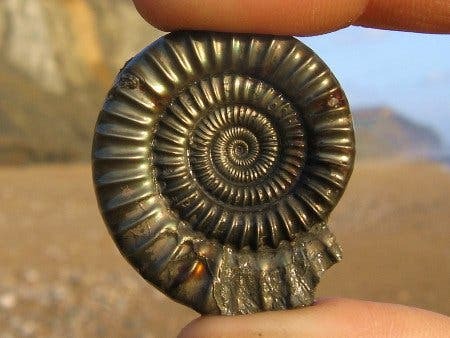 Ammonites are an extinct group of marine invertebrate animals which were basically ubiquitous throughout the Mesozoic, but went extinct after it. Finding an ammonite fossil is therefore not particularly rare, and they can be found in many places of the world. What makes it special is the fact that it was pyritized. Pyritization is a type of fossilization involving deposits of minerals within the cells of organisms. Water from the surrounding environment seeps into the pores of organic tissue and forms a crystal cast with deposited minerals. Crystals begin to form and this process continues This method involves the elements sulfur and iron. Organisms are pyritized when they are in marine sediments saturated with iron sulfides. Pyrite (aka fool’s gold) is iron sulfideuntil the central cavity of the cell, the lumen, is completely filled.